What do Google, Snakes and UFOs All Have In Common? Moriarty Airport is located 35 miles east of Albuquerque at an altitude of 6199 feet above sea level. Norm Bishop has lived near the Moriarty Airport for 23 years, and he's never seen anything like it. "I looked over here and I saw it coming directly at me. As it flew over me, I couldn't see anything. No sound whatsoever. I could see its silhouette, and of all I could see, it was just a wing. No fuselage; no vertical tail," Bishop said. "I wouldn't say it was from outer space, but [it was] an unidentified flying object. I had no idea what it was." But the unidentified object isn't his only concern with the strange things happening the airport. 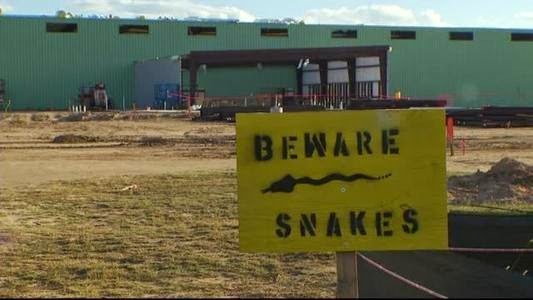 He's seen the modest hangars there for years, but wants to know what the huge building, with the sign out front warning of snakes, is doing there, aside from blocking the view of his favorite mountain. "Right above that hangar out there, you'll notice there's a little mountain," Bishop said. "I used to love the view of the mountain, but my mountain is gone." Turns out, Google bought Titan Aerospace in Moriarty back in April, and will be building, researching and testing drones at the airport. The big hangar, the lack of his favorite view and the "UFO" - all Google. The Google operation is expected to create more than 200 new aviation and aerospace jobs.